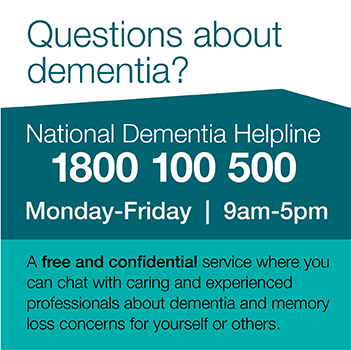 The National Dementia Helpline is available 9.00am to 5.00pm across Australia, Monday to Friday excluding national public holidays. It provides support and advocacy for people with dementia and their families and carers. Services include providing information, education, counselling and support groups. There are a number of Dementia Australia service providers available. You can get information by contacting Dementia Australia. Provides us to date information about Australia’s care system, services and assessments.